Your binding will be mounted before shipping the ski. Please specify your skiboot sole size in mm on the checkout page in the comment box. The evolution of the key model is a delicate task. Black Crows wanted to make the Atris more stable at high speed without altering its great handling and playfulness. The team was successful with this by intervening on three variables: extension of the radius, a softening of the flex and a more progressive heel rise. So, the Atris has become more easily handled at speed without altering its ease of handling. The new Atris gallantly opens the doors of a great ski. Double Beak | 23% Tip Rocker / 60% Camber / 17% Tail Rocker – Double Beak creates a ski that releases easily in the tip and tail. The central axis of the ski is dynamic, creating a ski that controls speed and trajectory very well in both powder and on the slopes thanks to it's easy pivoting style. This profile's balanced flex creates a stable, maneuverable ski that is nonetheless explosive when needed. A Double Beak ski benefits from being driven laterally in a centered stance, rather than forward through the tip of the ski. 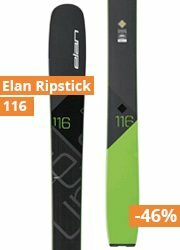 Increases maneuverability and versatility without sabotaging the ski's responsiveness and alpine character. A sidecut that flares progressively in proportion to its rocker giving superior on-edge grip. Meanwhile, the tip of the ski is now made of 3 distinct radii, adding purchase throughout the turn and increasing drive at low speed. Reactive and trustworthy, a single species Poplar wood core provides a consistent, poppy tip to tail flex. Durable construction that retains the edge power of sidewall construction while limiting chipping of the topsheet at the tip and tail of the ski. Durability and shock absorption across all snow and terrain. Fat Edges – These thick freeride edges are denser, stronger and more resistant than conventional edges.